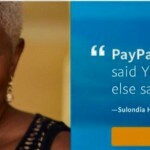 PayPal Working Capital – How I Became the Face for February! PayPal Working Capital Capital So many of you have contacted me or posted on my Facebook page that you have seen me on Pay Pal Working Capital’s website. Many of you have also inquired about PayPal Working Capital and how it works. What I can tell you is that it has been very beneficial for me. I recorded a 4 minute video to explain exactly what PayPal Working Capital is..